Bring back some of the best designs of René Herse, so that today’s cyclists could enjoy their excellent function and aesthetic. Support classic René Herse bikes with components, so that they can be kept on the road, or get restored correctly. Protect the René Herse trademark. 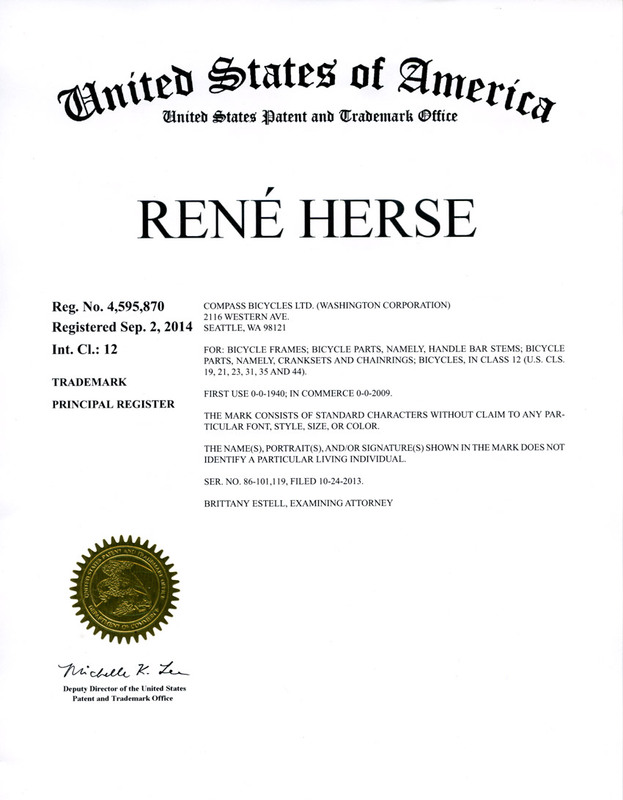 A big step happened a few weeks ago, when our registration of the René Herse trademark was approved by the U.S. Patent Office. While the trademark and designs were protected as soon as we bought the company from Lyli Desbois and started using them again, now nobody can claim that they didn’t know the trademarks were protected. There is no risk of the René Herse logo showing up on budget frames or cheap knock-off components. These legalities aside, we also have made progress on the other points. Our René Herse cranks have proven themselves, and many riders are enjoying not just their beauty and light weight, but also their almost unlimited chainring choices. And owners of classic René Herses can get chainrings again for their bikes, at least for the ones made after the mid-1960s. Now we are proud to introduce a few additional parts for classic René Herses and other cyclotouring bikes. Early René Herse’s bike were equipped with cantilever brakes of his own design. The brake pad holders were one-piece castings, which were designed for then-common short brake pads. The short pads cleared the fork blades and chainstays when the brake was opened to remove a wheel – a nice feature. We now offering replacement Herse brake pad holders. We made them a bit longer than the originals, so they fits Kool-Stop’s excellent Mafac reproduction brake pads. (Unfortunately, making replicas of the original pads is too expensive at this point.) To clear the fork blades, we offset the pad slightly from the mounting post. You don’t notice it, but it provides just enough clearance to open the brake all the way. The pad holders have the same angular aesthetic of the Herse originals, and they are also cast as one-piece units for durability. Many Herse bikes lost their wonderful straddle cable holders over the decades. We now offer replicas that allow you to complete your restoration. Of course, you also can use them on any other bike that has centerpull or cantilever brakes. 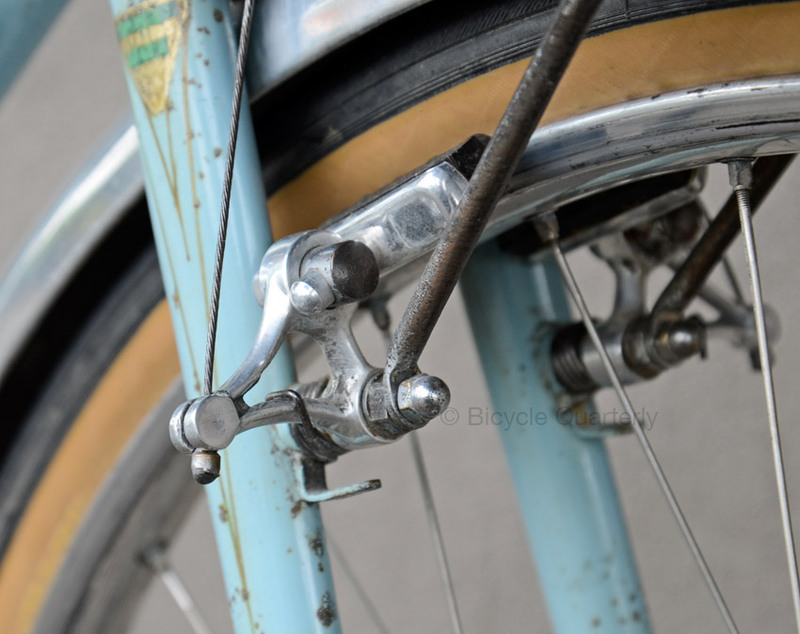 Mafac’s centerpull brakes are found not just on René Herse’s bikes, but on many other classic and modern bikes. Their performance is without par, but unless you find a set of “New Old Stock” (NOS) brakes, they’ll have seen decades of hard use. Fortunately, the arms don’t wear out, and we now offer all the other parts you need to make a set of Mafac brakes better than new. If your brakes are equipped with plastic bushings that have developed play, you can use our brass bushings to restore the performance of your brakes. (We’ll offer a tool to press in the bushings soon.) Or you can get a complete overhaul kit that replaces every nut and bolt on your brakes. Kool-Stop now makes replicas of Mafac’s “four-dot” and “five-dot” brake pads, but with modern rubber. They are available in black and with Kool-Stop’s excellent “salmon-colored” compound (above) that offers superior braking in wet and dry conditions. We have these in stock, too. One of the things that makes René Herse bikes special are the custom-made screws and bolts. This practice came from his aircraft background: During the early 1900s, there were no standards for bolts. Aircraft makers made their own screws to ensure they were strong enough. A bolt failure on an aircraft can have devastating consequences! The aircraft builders designed their own head shapes, so mechanics in the field could immediately see if a bolt had been replaced by a generic one of potentially inferior quality. Drawing on that tradition, Herse made his own bolts, too. The triangular heads for his M6 seatpost binder and stem bolts are truly iconic. We now offer replicas. We also offer the smaller M5 screws with their distinctive round heads, which Herse used to attach racks and waterbottle cages. These screws feature rolled threads, super-strong CrMo construction and durable chrome-plating. They are great not just for restorations, but also for modern bikes where you want screws that look nicer and are stronger than generic stainless steel screws. Herse also made special bolts to attach his brakes. The rear one features a built-in washer and a much sturdier head than the thin Mafac bolts that tend to break. The front bolts (above) were even more ingenious, as they incorporated a forward extension to attach a rack. In recent years, these bolts have been imitated by many, but never equaled. The originals incorporated a washer, and the forward extension was smaller in diameter, because the rack pushes down on the bolt and so doesn’t need as much clamping force. We now offer replicas that match the originals 100%. 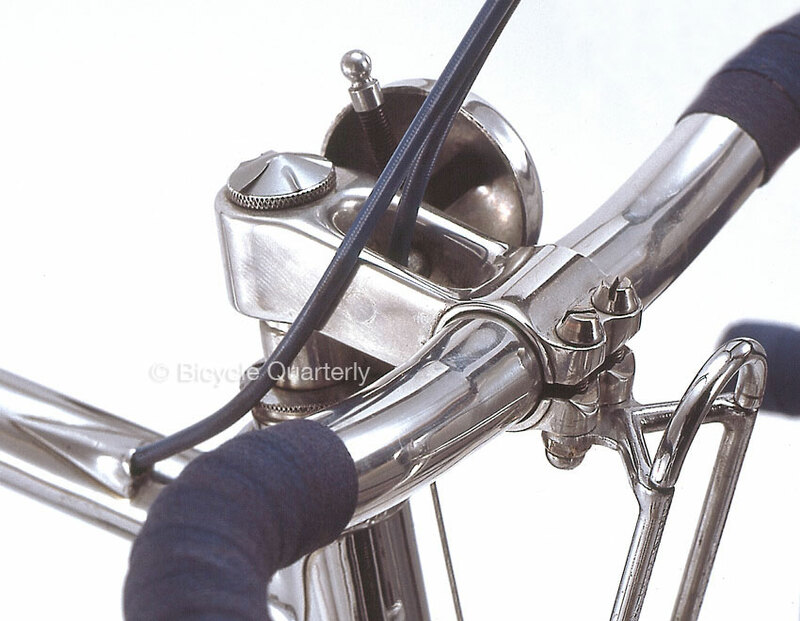 Many 1940s bikes from the best French constructeurs used fender eyebolts with round heads. They are so much more elegant than the large angular heads on current eyebolts. When I restored the PBP-winning Herse tandem, one of the more tedious jobs was making the classic eyebolts and matching cups – 9 sets. 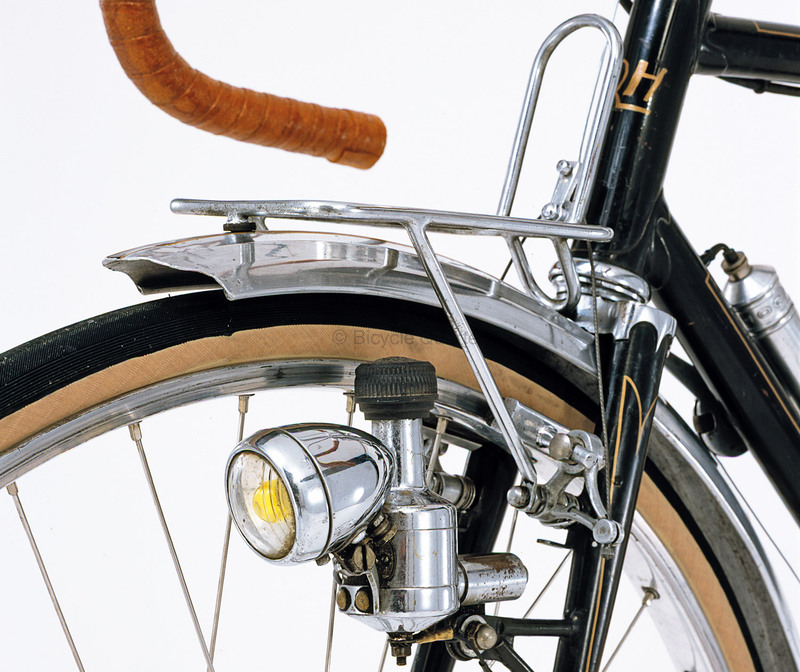 (Eight for the fenders, the ninth holds the battery-powered taillight to a fender stay.) Now we offer these eyebolts in two lengths: 7 mm (stay to fender connection) and 11 mm (stay to dropout connection). Maxi-Car hubs are my favorite hubs. With double labyrinth seals, they spin smoothly for decades. Unfortunately, they haven’t been made in 15 years, and when you find a used one, it often doesn’t have the axle length you need. To help with this situation, we offer reproduction Maxi-Car rear axles in two versions: One drilled for quick releases (left) and 140 mm long, so it can be adapted to all rear hub spacings from 115 to 130 mm. The second version is for a Nivex-style chainrest (right). It features a stub end that is drilled to receive the wing screw that holds it to the right dropout. The stub end ensures that the axle doesn’t extend beyond the outer edge of the freewheel, so the wheel clears the chain as it is removed. Both axles are machined from CrMo steel and heat treated, so they are even stronger than the originals. Our final product is potentially the most useful: We asked Gilles Berthoud to re-make the Sologne panniers in a classic model. Unlike Berthoud’s contemporary version with its plastic Klick-Fix attachment that tends to rattle, the classic panniers attach with leather straps and metal springs. This provides a relatively theft-proof and secure attachment that works on (almost) any rack, provided it has a spot where the hook at the bottom can attach. I use these panniers for all my touring, since they are waterproof and the laces allow expanding or contracting them as my luggage needs require. 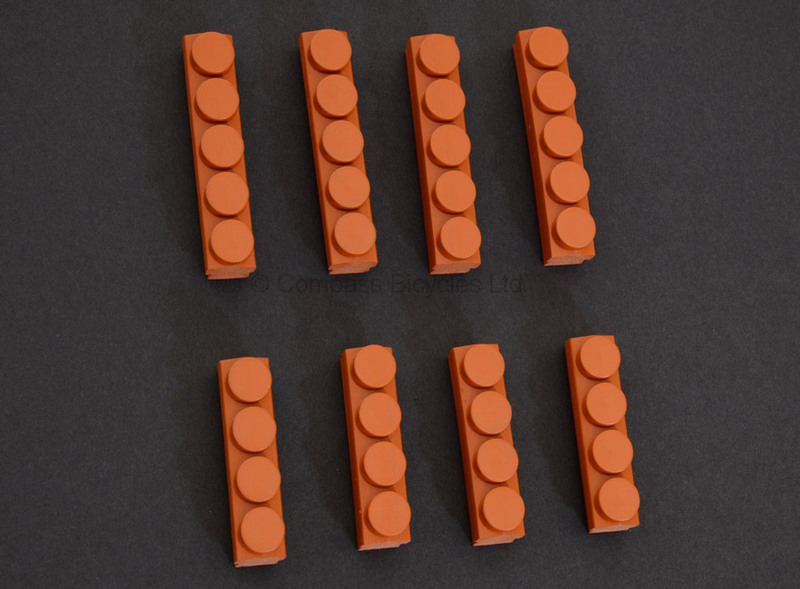 I have one original set that was made in 1974, yet still is going strong. Quantities are very limited, since these are specially made by Gilles Berthoud in France for us. We hope to expand these offerings in the future. Some high-end car makers like Porsche and Mercedes-Benz offer parts and support for the classics they made decades ago. We strive to provide the same service for the wonderful bicycles of René Herse. Click on here for more information about our classic parts. * In 2007, I negotiated the purchase for Boulder Bicycles, who bought the name from Lyli Herse. In 2011, Compass Bicycles Ltd. bought the trademark from Boulder Bicycles. This entry was posted in Components, Cranks. Bookmark the permalink. 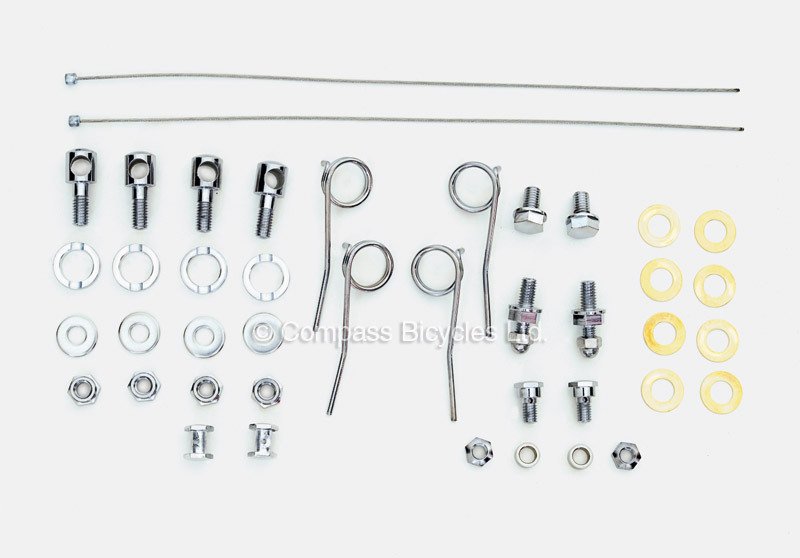 I like how your store lists everything under “components,” rather than splitting things into “components” or “accessories.” Lights, racks, fenders and bags are components of a complete bike, not just “accessories”! I’m in the homestretch of building my first custom rando bike. I’d seen the machined fender bolts that some of the nicer builders have used and wished I could buy some like them, as I don’t really like the bulky square-headed eyelet bolts with the super wide spacer. Then I saw your post this morning. Your timing is perfect! Any idea for the availability of the M5 screws? I’m curious why your fender eye bolts include a washer as you’ve made reference to not using washers if they are not needed. I would think the nut would be directly against the cup. The M5 screws with the triangular head are available now. The eyebolt needs a washer, because the fender goes in between the cup and the nut. You need the washer to spread the load over a larger area of the aluminum fender. Without it, the corners of the nut could cause the fender to crack. DG, I beleive Jan had previous mentioned leaving off leather or rubber washers. Also, I am interested to know how much the domed bolts sell for? They don’t seem to be online or in the restoration section. The classic eyebolts sell for $ 18 for a set of 4. They may be a bit difficult to find among all the bolts! Here is a direct link. Sorry, I was referring to the m5 with dome for racks and waterbottle cages. Sorry for misunderstanding. You are right, those weren’t on the “Restorations” page. We fixed that oversight. The price is $ 6 per pair. Since we made a lot of them for the new Compass centerpull brakes, the per-unit cost is much lower than with some of the other bolts. I have an upcoming bike build and now it’s going to be a lot nicer! The rounded eye bolts is an especially nice addition, as I’ve always thought the harsh-looking stock bolts from Honjo doesn’t quite match the beauty of their fenders. Thanks for what you do! Have you bought / Will you try to buy the Nivex brand and manufacture again those derailleurs and dropouts? Probably the tooling costs would be just monstrous. But you always say they are the best. Maybe you can just become a clearing house for old ones and remanufacture them as you did your own. Maybe this is better: Can you buy the rights to (maybe the patent has expired anyway) the Nivex chainrest dropouts? 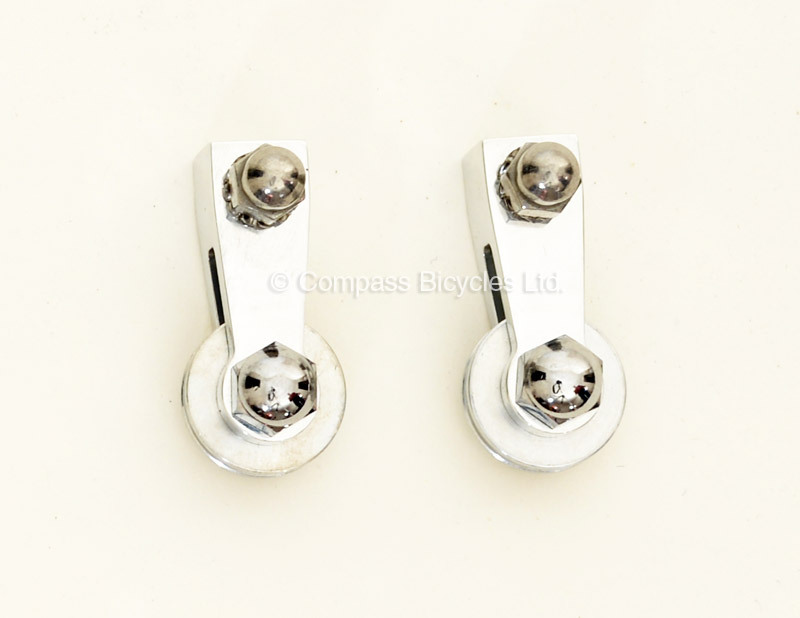 I think it would be cool to offer Compass branded Nivex style dropouts (for the chainrest part) for custom frames. Then you could at least make the dropouts & axles to fit todays hubs and frames. It’s nice to think of the rear wheel coming off easily without one’s hands getting tremendously greasy. I assume manufacturing your own axles & nuts would make the wheel come off cleaner than just using the usual quick release? Or maybe not. Well made freewheel body with french thread to match many of the MaxiCar hubs would be swell. What size screw driver is required for the triangular heads on the M6 seat post bolts? I’ve found that different blade profiles make a difference. The bolts are exact replicas of the originals. The slot is cut 1.0 mm wide, but after chrome-plating, it measures about 0.95 mm. It’s straight. You only use the screwdriver to keep the bolt from rotating, and you tighten the nut on the other side. So the size of the screw driver is not that crucial. Most mid-size screw drivers will fit. It seems to me that having a few older screwdrivers in various sizes lying around is a good idea when working on older bikes or machinery as the slots on those old screws tend to be quite narrow. Personally I inherited such tools from my grandfather, but you could always file down some modern screw drivers to fit. I foresee lots of busy Framebuilders in coming months! I don’t mean to write another Dear Santa, but I would like to see dropouts designed for using eyelets instead of R-clamps. It is a small detail that tends to be a hurdle in terms of taking extra time and risk when R-Clamps use off-the-shelf dropouts. If they were available, I think they would become the default for custom bikes with fenders. Do you know of a source? Speaking of mounting fenders, it is odd that we can’t order extra fender hardware like stays and R-clamps from Compass, and Boulder is about the same. I was surprised to see JP using VO fenders and stays when the Honjo stays seem to have a much higher yield strength, but VO are easy to get. It would also be nice if the Honjo stays were polished. Is there any reason I could or should not attempt to polish them? Fenders stays are a nightmare to keep in stock – especially since the stays are specific to each fender width. However, we decided that they really should be available separately. For example, if you don’t use a front rack, you really need an extra set of stays to stabilize the front of the fender. Soon, we’ll offer them separately. Polishing the fenders stays isn’t a problem. I’d start with fine sandpaper, perhaps 600 grit, then 800, then polish, and it won’t take long. Honjo sells polished stays, but they aren’t part of the fender sets… which means you’d end up with a spare set of stays. It’s easier to just polish them. If I understand rinko bike packing as described in BQ 48 correctly, the René Herse straddle cable hanger is not well suited for that end since the straddle cable could only be removed after loosening an additional nut. Any thoughts about this? For Rinko, we used a special centerpull brake where the straddle cable unhooks on both sides. That eliminates the problem. We’ll offer this soon. Is there a chance you will come out with chain-rings that fit Campagnolo chains? Our chainrings fit Campagnolo chains up to 10-speed. They don’t fit 11-speed, since we figured that we’d rather have longer-wearing, more durable teeth. We may, at some point, offer 11-speed chainrings, but with so many chainrings, it’s a significant investment.